Enjoy the local history and spirit of Trujillo, as you are introduced to the rich mix of cultures and flavors that make this Caribbean city so unique. 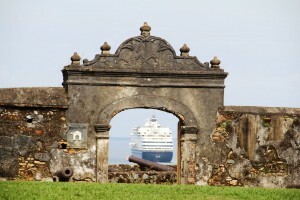 Start with an inside visit to the Santa Barbara Fort, which provides spectacular views of the bay. 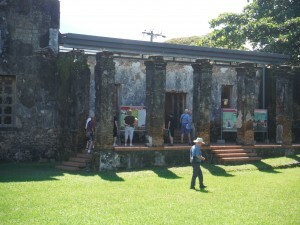 The fort was originally built in 1575, only to be destroyed in the 1600s. Abandoned for 100 years, the fort was eventually rebuilt by the Spanish in 1780. Continuing on from the fort, you’ll visit the Town Plaza, San Juan Bautista Church, and the remains of the old British, French, and U.S. consulates. Throughout the day you’ll be entertained with stories about pirates, bootleggers, adventurers, William Walker, O’Henry, and more. A stop will be made at “Made in Honduras”, a store where local crafters and artisans work and sell their goods. 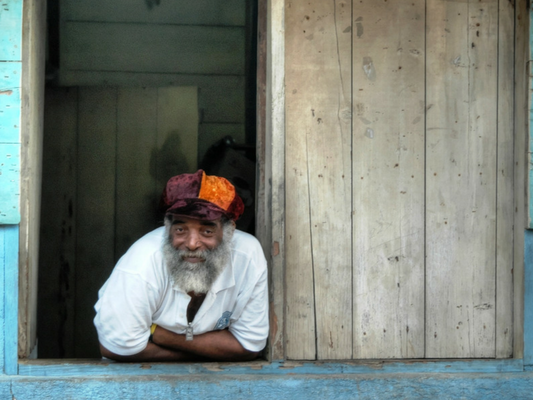 Continue your cultural exploration of Trujillo as you enjoy a taste of various cultural treats from the Honduran, Garifuna and Pech communities. Enjoy this Cultural Exploration of Trujillo! As this excursion involves walking over uneven surfaces, it is recommended that guests dress in casual clothing, a hat, as well as wear flat, comfortable shoes. It is recommended you bring sunscreen and insect repellent. Participants must be able to negotiate in and out of the vehicle with minimal assistance. This excursion is not recommended for guests with walking difficulties and is not wheelchair-accessible. Inside the Fort there are steps and inclines to negotiate. Please be aware that the food items are samples only. We will do our best to answer any question you have related to our tours, our company or Honduras. Read reviews here. Or, you can leave a review in the comments at the bottom of this page. Once approved, your review will be added. Thank you! We took a two hour tour called “A Taste of Trujillo” (we were on the “SS Ryndam”) – the highlight was clearly a tour of this colonial city’s historic fort. It was well worth the visit, but could use a more typical ‘guided’ format. The fort was cool, and there is a great arts and crafts marketplace right next store. We booked the “Taste of Trujillo” tour through NCL. We boarded an air conditioned small bus that looked like it had been well used, but was comfortable and adequate. Our tour guide was obviously very new in her job, but was friendly, smiling, earnest and well-intentioned. Our guide mentioned that Columbus first landed on the Banana Coast and spoke a bit about the banana barons and told us that the local fort, which ruins we saw, was for the purpose of defense. When asked from whom, she said “pirates.” We say the outside of St. John Cathedral I did duck inside quickly to get a few pictures. Then we stopped at a pretty riverside area, where dancers, drummers/musicians entertained with traditional dancing. We were then ushered into a small, very clean restaurant to taste some local foods. The samples were tasty. The manager seemed very eager to make sure we were enjoying our visit. There were small glasses of a punch-like beverage or you could purchase soda, water for $1. I think they also had beer, but am not sure the price. During our ride, I was charmed by the locals who smiled and waved. It is obvious that these people are determined to make sure that the port is a success and that the visitors are happy. And I was. I am glad I did this tour. Loved the Fair Trade Store (Made in Honduras)! Guide spoke English and was very knowledgeable and informative. We took the Taste of Trujillo Tour. We saw performances of native dances and at local cuisine.